Here is a stamping mani I created using my 'Bug' plate (MM17) from Messy Mansion. 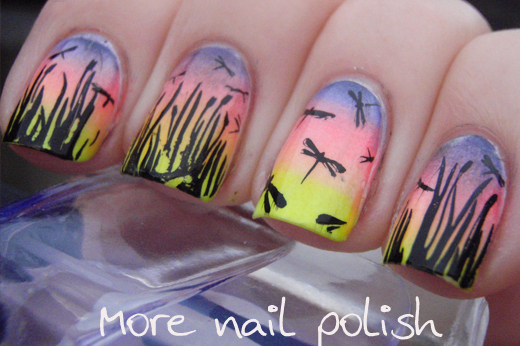 The stamp has a double width image of cattail reed with little dragonflies above as well as a full nail stamp with just dragonflies. I love the extra wide design, because it means that each finger as a different design on it, rather than repeating the same reeds and dragonfly placement. I created a gradient by first starting with a white base, then sponging on Kester Black Periwinkle and Picture Polish Sunset and Crazy. It created a sunset look, which is exactly what I was going for. I just love dragonflies. Every summer we get them hovering and circling over our swimming pool. They are incredibly beautiful creatures. These Messy Mansion plates are lovely and large. The cattail reeds design easily covered three of my fingers without repeating any part of the design. 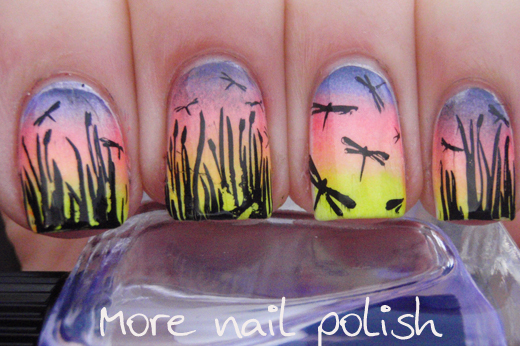 They would be excellent if you had longer nails too, because there are dragon flies above the reeds that didn't make it onto my nails. 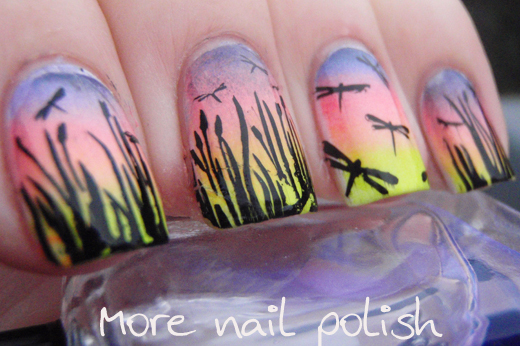 OMG - Beautiful gradient and stamping, fab mani. I'll have to look into the MM plates! Wow, this mani s outstanding!!! Oh myy, this is absolutely gorgeous! I love the design so much *-* Stunning! wow! this is so pretty and makes me yearn for the summer ahead! it can't come fast enough now, winter can just leave please! :) I love this.. so pretty! Impressive! I love all her plates.